The official photographer assigned to the University is Bryan Studios Limited. Only the official photographer will be allowed to take photographs during the ceremony. No portraits will be taken on Graduation Day. Photographs will be taken (from October 1 - 31) at Bryan Studios Ltd. Shop 23 & 24 Kings Plaza, 38C Constant Spring Rd. Kingston 10. Bryan Studios will be at the Western Campus on October 19 and 20. Packages will be done at Bryan Studios Ltd upon presentation of printed financial clearance letter from the finance department and payment receipt. Make-up will also be available at the Bryan Studios Ltd, payments for which must be made at the studio. 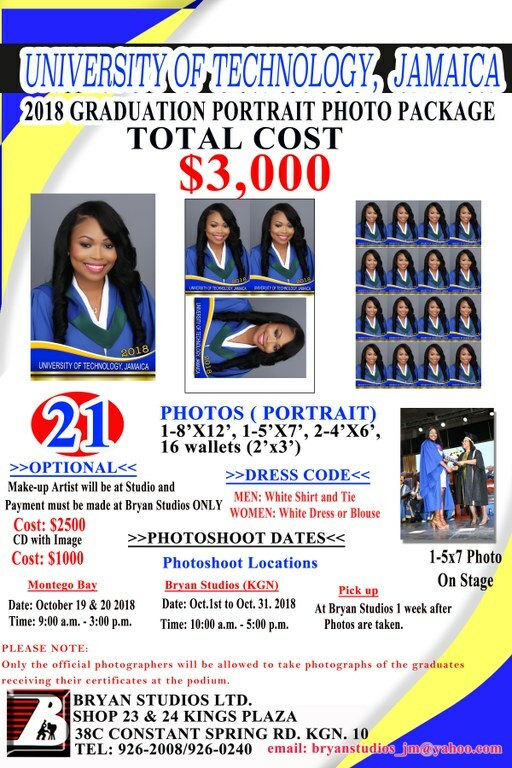 Please note the Graduation Package is inclusive of Photographs. All photos must be collected from Bryan Studios Ltd.